Statistics Canada reports that more than 2 million students are enrolled in post-secondary education? That's a lot of transitioning. If you're one of the students on that path, or the parent of one heading in that direction, here are some tips to help make the transition successful transition. EMBARGOED TO 0001 MONDAY JUNE 29File photo dated 16/07/08 of university graduates. 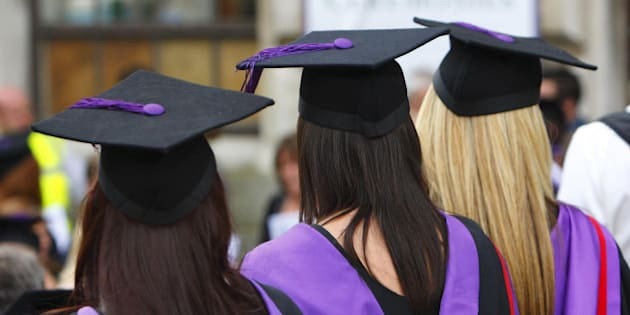 Job vacancies have increased to a post-recession high, especially for university graduates, according to a new study. As the cap and gown are hung in the closet and the diploma is mounted on the wall, graduating high school students celebrate graduation and look forward to the days of summer. These sunny months are also a time of transition as students prepare for the next phase of their lives, and for many this means heading to university or college. When I was a student, the summer months meant balancing work and play. I worked most summers to help pay for my tuition, and have my own spending money. Summer was also my time to try out a few different things -- what jobs I might like come graduation or a dream summer job. But taking advantage of downtime was also important. How? I tried to schedule a week of holidays with friends before starting the coming school year, fun on the weekends and gave myself a little more going out time during the summer break. Summer continues to play a transition role for me today. Whether it's my son transitioning into Gr. 1 or my current situation as I settle into my new job as Director of Student Banking at RBC. Reflecting back on my summers as a student, I realize that while change in any capacity can be challenging, it is an exciting time to embrace new possibilities as well. Did you know, Statistics Canada reports that more than 2 million students are enrolled in post-secondary education? That's a lot of transitioning. If you're one of the students on that path, or the parent of one heading in that direction, here are some tips to help make the transition successful transition. You've worked hard over the past 12+ years so take a well-deserved break. Celebrate with high school friends you may not see come September. If you're going away to school, this may be the last time you will be living at home. Discuss your new independence and responsibilities. If you're living at home next year, it may be time to show you're financially prepared and independent. Calculate how much money you will need for the school year -- everything from large expenses such as tuition and housing, to living expenses including groceries, transportation, technology and entertainment. Don't forget the hidden or unexpected costs -- like laundry detergent and toilet paper. And the fun costs like going out with friends, holidays or a new pair of shoes. Determine who will be paying for which items. The summer will go by quickly and while shopping is often fun for us, avoid stress by shopping early. Make a list of the items you need -- from clothes to technology, school supplies, and accessories for your dorm room -- and decide how much you have to spend. The back-to-school sales are starting earlier each year, so you can do research online to compare prices, track costs, and exercise responsible spending. For many students, going to college or university may be the first time they've lived away from their families and that means a new and unfamiliar environment. Schedule time during the summer to take a tour of your new school and city. Check out the local transportation so you know how to get around as well as where you will do your shopping, banking and other activities. I think it's worth attending your school's orientation -- to meet new people, and find a few tips and tricks to student life. It's another great way to make sure it's a smooth transition. No matter where you will be in September, the summer months are the perfect time to take advantage of a more relaxed routine to recharge your batteries and plan for the many new opportunities in the coming months.